Nathan Medley, a Harrisonburg High School graduate who has earned international recognition, will headline this year’s Shenandoah Valley Bach Festival at Eastern Mennonite University (EMU). The June 12-19 festival will include three major festival concerts, a Sunday morning “Leipzig Service,” a week-long chamber music series, a Baroque workshop, programs for youth and older adults and other musical opportunities. The Bach Festival, in its 24th year, has been called the “jewel in Harrisonburg’s crown” by the Virginia Commission for the Arts. About 4,000 people from about 20 states and several countries typically attend. Medley, the son of EMU professor Mike Medley, earned a degree from Oberlin Conservatory in Ohio and has since taken his countertenor voice to some of the world’s greatest stages. 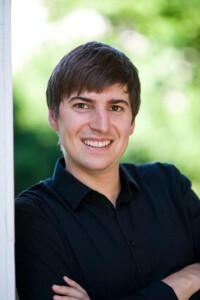 He will perform at the festival’s second concert, Friday evening, June 17, at EMU’s Lehman Auditorium, and at the June 19 Leipzig Service, also at the auditorium. The Harrisonburg High School choir will join Medley on stage for the Friday evening concert, and his former teacher, Tommy Tutwiler—now in Washington D.C.—will also sing. Clarinetist-turned-recorder virtuoso Nancy Buckingham Garlick, a lecturer at the University of Virginia, will bring an additional dimension to that night’s program, which features early-period classical music. Bach Festival executive director Mary Kay Adams says plans to bring Medley back to Harrisonburg have been in the works for several years. The festival opens Sunday, June 12, with a 3 p.m. concert titled “Bach’s Work Week: The Sunday Cantata.” It will feature tenor Brian Thorsett and three local soloists: soprano Christine Glick Fairfield, countertenor Joel Ross and baritone David Newman. The third major concert, Saturday evening, June 18, will take a different tone with an exploration of “Rural Roots.” Music by 20th-century composers Aaron Copland, Virgil Thomson and Alberto Ginastera—marking the 100th anniversary of the Argentinian’s birth—will be featured. The Leipzig Service, a time of worship in the style of Bach, will include a homily by Pastor Brett Davis of Harrisonburg’s Muhlenberg Lutheran Church. The service will feature the orchestra and Medley this year rather than a choir. Other events include the free chamber music series ($5 donation suggested), held over the lunch hour daily June 13-18 at First Presbyterian Church, 17 Court Square in downtown Harrisonburg. Each day features a variety of pieces by Bach and other composers. 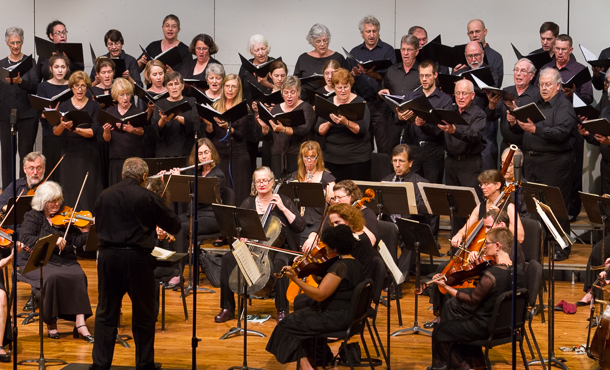 At Thursday’s performance, Medley and a chamber ensemble will do a choral setting by John L. Gardner being presented as part of the Virginia Shakespeare Initiative. The ensemble Musica Harmonia, which includes EMU professor of music and Bach Festival concertmaster Joan Griffing, will perform music by Gwyneth Walker at three of the concerts. The ensemble’s new CD will be released during the festival. Festival Fellowships bring five youth and young adults to play with the festival orchestra, while other students serve as interns in a variety of arts management support roles. For older adults, a Road Scholar program offers a week-long educational experience surrounded by music. Another educational opportunity is the June 12-18 Baroque Workshop, which gives participants a chance to learn how to play early musical instruments in the period’s style. A new Baroque dance workshop has been added this year. The 2016 festival also marks a farewell of sorts, as Adams finishes a 10-year run as executive director. Adams, a flutist, is one of four members of the festival orchestra who have been part of the group since its inception and says she plans to keep playing after retirement. She says EMU, the festival’s board, the guild of donors and other supporters, the orchestra members and a host of volunteers have all been a huge help in pulling together the event each year. Ticket information for the three main concerts and other information on the festival can be found at . Tickets can be purchased online or at the EMU box office in the University Commons, 10:30 a.m. to 2:30 p.m. Monday through Friday. Nafziger says the public is also welcome to sit in on the orchestra’s rehearsals, held each morning and afternoon in Lehman Auditorium the week of the concerts. Next year’s Bach Festival, marking the event’s 25th anniversary, will be June 11-18, 2017.